This is a guest post series from Danielle of Roadschooling with The Frugal Navy Wife. Daniele and her family homeschool while on the road in their RV – also known as roadschooling! Come follow along with Daniele as she shares her wisdom in this Roadschooling series here on FHD! Danielle will teach us tips for buying an RV, organizing an RV, ways to save at campgrounds, her thoughts on RV insurance and memberships, and tons more. Storage space is at a premium in a small space like an RV. It can be hard to add storage because of limited floor space. When you are living in your RV full-time like we are, it is VERY important to maximize any possible storage. These 10 storage hacks save you space and your sanity! I saw the idea for Shoe Rack Bed Storage on Pinterest and it’s genius! Take a shoe rack you normally hang on a door, and cut it in rows. Then attach those pieces to the side of your bed under your mattress. You can use it for shoes or other little storage items like toiletries, papers and more. This one has been a life saver! No one likes spending 30 minutes hunting for a remote! This is even more of an issue when your house is on wheels and moves around. Little things like remotes tend to get lost a lot easier! Using Velcro helps keep them in place. Since bathroom counter space is at a premium, use a shower curtain that contains pockets. This clears off the counter clutter, while adding more storage space. → Tip: Things like hair spray, lotion, and make-up are perfect to store here! Don’t store anything electrical, of course! Use a simple over-the-cabinet basket to maximize storage space. This is a perfect solution for storing items like sponges, soaps and more. Hide all of your trash with a simple over-the-cabinet door waste basket. It keeps your trash out of sight but saves on valuable floor space as well! There is only so much space in cabinets and on counter and floors so what do you do? This hanging basket keeps food off the counter and frees up counter space, while keeping contents easily within reach. Command hooks attach to the inside of your cabinet doors. Use the inside of your kitchen cabinets to hang cooking utensils and free up premium drawer space. Nesting bowls are a must for saving cabinet space! This set has nesting bowls and nesting measuring cups. Magazine racks are an efficient way to maximize space. Store art supplies, school work, books and more! Plastic grocery bags are quite helpful as trash bags, sorting containers, tote bags and more. However, they can take up a lot of room if you aren’t careful. Store them in an old baby wipes container so you can pull them out one at a time, baby wipe-style! What storage trick is a life saver in your RV? → What Vehicle is Right to Tow Your RV? 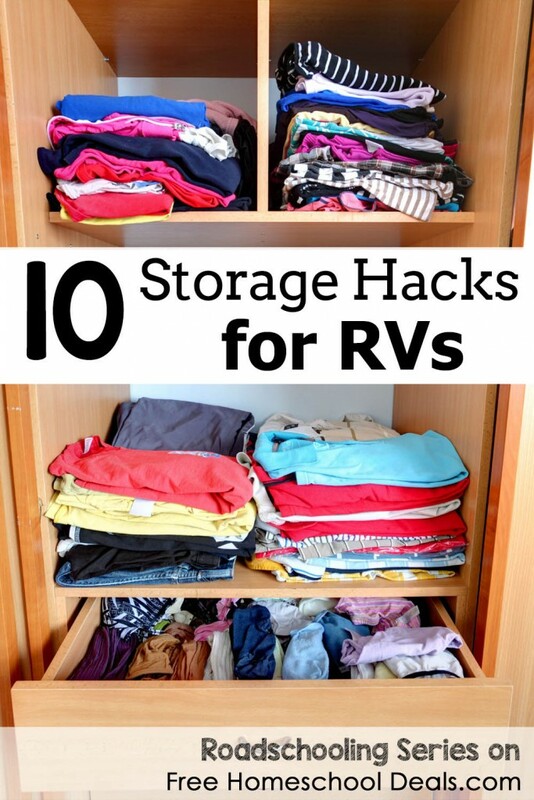 → 10 RV Storage Hacks – this post! Follow the Affording the Homeschool Life Pinterest board! Click here for a bunch of additional articles to help you in affording the homeschool life! Danielle is a mom of 4, Former Navy Wife, Homeschooling mom, frugalista and blogger at The Frugal Navy Wife. She and her family of 6 are currently setting out on their lifelong dream to travel via RV around the United States. They are documenting their journey on Roadschooling with The Frugal Navy Wife.